And I cannot resist costume kitties, especially free ones. 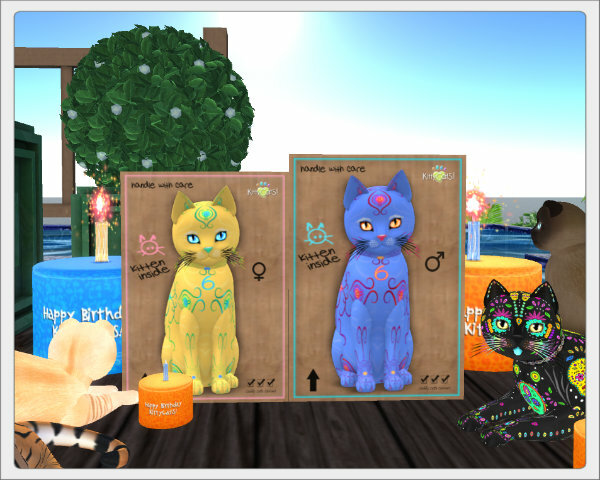 You get both the kitties for free but with the boy kitty, you need to do a little hunt at the KittyCats Mainstore. Find 5 little orange cakes outside the store and 1 little orange cake inside the store. Once you've found them all, all you need to do is click the blue cake inside the inner courtyard of the store. Fortunately for me, while I was there to buy food for my kitties, someone posted the hints for the little cakes. Otherwise, I would have only searched inside the store and given up. 1# Cake Hint: The grass is green and the chairs are blue! 2# Cake Hint: A great spot to relax and fish, grab a beer while you are at it! 3# Cake Hint: Cake is delicious at a picnic! 4# Cake Hint: This is rock solid proof that two cats can eat a cake! 5# Cake Hint: All freebies are here! Careful not to bark at the wrong tree! 6# Cake Hint: Treasures are hidden among chests, cats like to disco party! This hunt reminded me when hunts used to be done in mainstores. It was such a pleasant experience! Thank you so much! You can also read about it on the KittyCats blog. 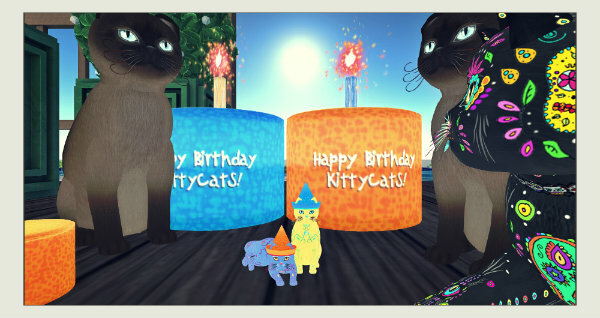 Here is the LM to the KittyCats Mainstore.